In recent times, there have been a number of Who’s Who in HR/Technology lists that have been written. We see them retweeted, linked to and published both in mainstream media and online sources – one thing they all have in common is that they are all US or UK based. 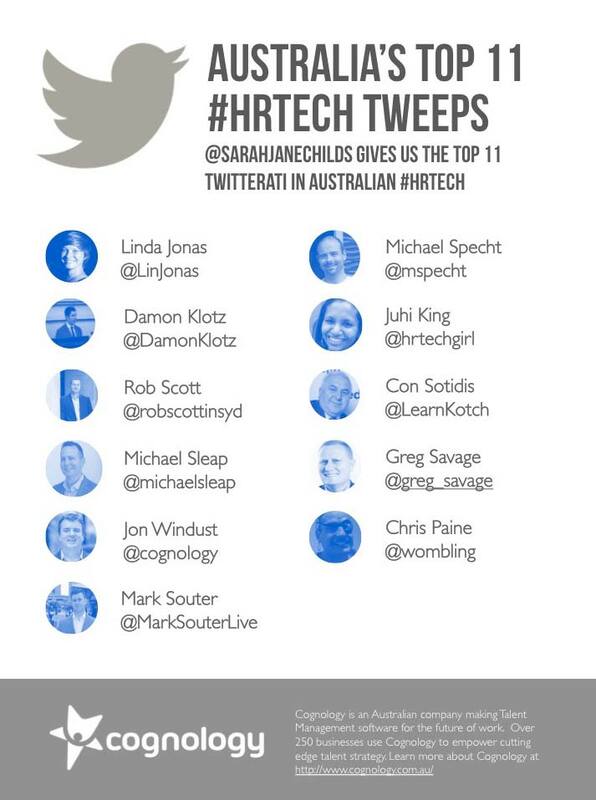 Where is the Australian list of Top Contributors to HR Technology via Twitter? Well, I am glad you asked. Of course, any list can always be added to, and I couldn’t possibly cover every nook and cranny of Twitter, but I have given it a red hot crack. Very careful consideration has been given to the criteria for inclusion on my list, and in case you are interested, here it is: In my area of expertise, I looked for those who are leaders in the field of HR Technology (specifically), and who are also sharing that information with the wider HR Tech community through Twitter – many also have blogs and are on LinkedIn. I have also included those that I have learnt from – either from a technical perspective, strategic or just about how the HR Technology industry is growing and progressing. Being social has dramatically changed how we access and find information, connect with people and even virtually attend industry conferences. After attending a very successful inaugural HR Tech Fest 2014 @HRTechFest this week, the Twitter sharing amongst the Australian and New Zealand HR Tech community was informative, at times provocative but also fun and inclusive. There was Twitter banter between participants as well as the speakers in their down time. Many of the international speakers are much more accessible because they are on Twitter. I have to explain that I have made a call to differentiate between those that use Twitter to connect and share in general about all things HR, and those that are tweeting specifically about HR Technology. The US list of the Top 100 Most Social HR Practitioners here is definitely worth a look, as it covers HR, Recruiting, L & D as well as HR Technology. So, here is my list of Australian HR Tech Tweeps that you should follow (in no particular order!). Why: I would argue he is Australia’s top HR Tech expert. Currently working for Navigo Research and has a wealth of knowledge about the industry including the vendors. Michael has been tweeting since 2006 and blogging forever! Why: Juhi is active on Twitter and has her own blog about HR Tech musings here. Why: Particularly at events, Michael is quite active on twitter. His tweets are insightful, informative and he takes into account an overall organisational perspective, not just a HR Tech view. Why: Rob is very active on Twitter and regularly shares his insights as well as great articles and links about HR Tech in Australia. He also has a blog here. Why: Tweets about Learning and Development and his passion for the subject is palpable. He has interesting views on Learning and Development and how using technology advances everyone on their learning journey. Con is active and interesting on Twitter. He also blogs here. I have learnt a lot about MOOCs. Why: Linda is great at sharing HR Tech tweets from her international network of HR Tech professionals (she told me she has met most of them on Twitter). She has broad experience in areas other than HR Technology and this shows through in her interactions. Why: Greg has a recruitment focus, but shares content on recruitment technology and the intersection of recruitment, branding and HR – always interesting and insightful. Is also highly regarded globally as an influencer. His blog is here. Why: Jon tweets a lot! His retweets are informative and always have a comment to make you think about what you are going to read. Tweeps involved in a specific technology and their tweets are quite technical at times! Not for the faint hearted. Why: SAP Mentor and expert. Tweets are often technical, so follow if you are a developer or want to find out generally about SAP/SuccessFactors. Chris live tweets from all kinds of SAP events. He links out to the SAP online resources, has his own blog. I often find out new things about SAP from Chris. Why: Tweets often about what is happening with SuccessFactors and retweets lots of the regular international Twitterati. An HR professional by trade, in HR technology for most of my career, implementing my first system in the year 2000. I am passionate about technology and how it shapes our World of Work. I am on LinkedIn https://www.linkedin.com/in/sarahmoorehrtechnology. Who should control enterprise social technology in the organisation, IT or HR? This is an interesting problem because it isn’t so clear cut and because HR may not realise this should be on their radar. HR is ultimately responsible for selecting and running the HRMS system used in an organisation. IT needs to be heavily involved in the selection process and ongoing technical operation of the system to be sure, but I don’t think anyone would say the HRMS is predominantly the domain of anyone other than HR. Likewise, IT is responsible for key technologies such as email and productivity applications. It’s unlikely HR would be consulted on these systems in any organisation. But what about social technology? Where does it fit? It’s an important emerging talent management tool for recognition, rewards, kudos and sense of belonging. It’s as much about improving an organisation’s culture as it is about productivity. HR own the policy controlling employee use of social networking technology. Productivity improvement is (or should be) the domain of the HR group. It needs to integrate well with other HR systems and processes. Social tech is an important communication platform for all matters, not just people related. It’s a productivity application or part of a wider productivity application. It needs to integrate with other key IT systems. So who should it be? The answer I believe is that this requires the marriage of two of the most unlikely partners. Both IT and HR need to work together to make social tech successful in the organisation. A bit like Leonard and Penny on The Big Bang Theory. Opposites attract, like Leonard and Penny. Opposites can complement each other’s skill sets. Just look at the pairing of Steve Jobs and Steve Wozniak. HR and IT have a long future together as social tech develops and evolves over the next decade. But HR needs to realise now that they need to be part of this. We have been using our own enterprise social technology internally now for some time. I’d like to share just one of the many experiences. In part I’m doing this to help illustrate the benefit of enterprise social technology. It helps answer the question of why someone would want to use it. I’m also sharing the experience to shed some light on the technology for those who are wondering what it’s all about. There are a myriad of uses for social tech in the organisation … this is just one. A wall or news feed makes so much sense. We are social beings, we operate under social constructs. It helps to be able to see things that are happening across a group or wider group. Having used our wall quite a bit I couldn’t go back to pre-wall. For example, one of the uses of the Wall is to recognise others. As a manager I find this one of the most powerful and positive tools in my kit bag. When someone does something that deserves recognition, it’s wonderful to be able to put a thank you note on a wall so others can see. And it’s such a buzz when you see team members giving each other recognition. The potential to waste time. Replacing face to face interactions. You may wonder whether a wall creates a social love fest. A frenzy of recognition and other posts. It doesn’t. It’s rare to see the same person giving recognition more than once a fortnight. My experience is that recognition has been given sparingly, where it deserved to be. If it were given for even the slightest thing, for the sake of it, I believe it would quickly lose its benefit. The wall hasn’t magically created a perfect working world. Not every situation and person that truly deserved some recognition, received it. I think the truth is that people are just busy working and don’t always think to do it. But there is more recognition, a lot more. And it’s much more visible. When many HR people think of social tech, they are probably thinking of sites like Facebook and Twitter. Let’s face it, we’ve all read news stories about their inappropriate use. The question is whether we should sacrifice the benefits of enterprise social technology to protect our organisations against potential misuse. My experience is that I haven’t seen any misuse at all. But I’ve read the news stories like everyone else and I know it can and will happen. So do we avoid social tech? I believe that would be crazy. That would be like saying no to the introduction of computers into the organisation in the 80s and 90s because of their potential for misuse. The real question should be how can we minimise the possibility of misuse and protect people from it. The answer is that people, managers and HR should be given control over information sharing and visibility. And of course, appropriate policies are needed. But those policies are needed now regardless of whether you have enterprise social technology. It’s counterintuitive, but I believe enterprise social technology helps protect organisations and their people. This is better explained by pointing out what happens if an organisation doesn’t implement social tech. People will eventually find their own social solutions which organisations won’t have any control over. From a leadership perspective face to face conversations are the shiznit. Great progress has been made in recent years getting leaders to have one-on-one conversations. Anything that threatens to undo all this progress is going to be received with some caution. So does a wall replace face to face interactions? No it doesn’t. It enhances them and makes new things possible. Here’s three ways it does this. If you’re a manager, ask yourself how often you see team members recognising other team members in front of others. It happens, but infrequently. To make things worse, you most likely won’t be there in the moment it happens. You probably won’t hear about it. The wall improves both of these problems. For reasons explained below, recognition is more frequent. Everyone doesn’t have to be there in the moment either. If you aren’t there, you’ll still see it, you won’t miss out. How does a wall increase the frequency of recognition? The answer is something called the gift economy. In short it means this. Joe gives recognition to Sally. This makes Sally more likely to recognise Joe some time down the track when he deserves it. In my experience it also makes it more likely that Sally will think to recognise someone else. The wall also gives people a greater reach. Visibility is not just restricted to one or two people. Recognition is not just heard by those in the verbal vicinity. People across a wider group get to see things they previously couldn’t. A couple of posts ago I wrote about the new world of work and the need for HR to be part of the change. I’d love to hear your thoughts on enterprise social technology. Is HR resisting social technology? I believe social and HR technology is helping to bring about a new world of work. But is HR itself getting in the way of this happening? Sometimes it doesn’t take that long for big change to occur. When personal computers started to arrive in corporate life during the late 80s and early 90s secretaries and typists were commonplace. It wasn’t uncommon for a manager to draft a communication, send it to a secretary, who would then type it up and send it back for review before sending. 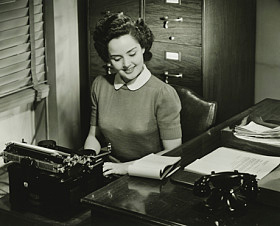 Amongst other benefits, inexpensive and usable personal computers provided a great opportunity for organisations to save time and money by getting managers to type their own communications. PCs were implemented at a rapid pace along with organisational edicts for managers to do their own typing. Despite the obvious advantage of using computers to draft, edit and produce communications, many managers were highly resistant to the change. Computers were things they didn’t understand. What you don’t understand, you fear. But by the end of the 90s you would be hard pressed to find secretaries typing communications anywhere. Today it only survives in limited areas like law firms who seem to love dictation as a form of creating a communication. I believe the vast majority of managers who were resistant to the change that occurred in the late 80s and early 90s would not want to go back to the way things were. They wouldn’t want to wait for a secretary to type something. Nor would they want to be without the easy way to get their ideas into a document, then edit and perfect them before communicating. Social technology is changing the world today. And talent management technology is becoming increasingly more important in organisations. Now we are starting to see the two combined. It makes great sense, we are social beings. We operate in a social way, even at work. We aren’t automatons. So is HR resistant to social technology in the workplace? Undoubtedly many are. This is understandable though. Social technology is relatively young. Many people still believe that Twitter is used by people who want to tell everyone inane things about their cat and what it does all day. Add to that the potential legal issues of using social technology. For example, bullying via social technology. It’s understandable that HR would be resistant. The change is happening though and won’t be stopped. Not for any other reason that the new world of work is just too compelling. 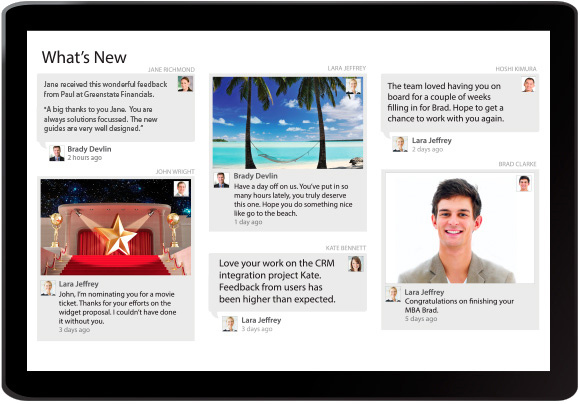 Combining social and talent management technology makes a lot of sense. HR can elevate its importance in the organisation by embracing it and driving its adoption in the workplace. If HR doesn’t do this, someone else in the organisation will. Just like the managers of the late 80s and early 90s, I don’t believe HR will want to go back to the old world in ten years time. People talk about removing organisational silos meaning departments and teams that don’t communicate. I think we have something more problematic. We have individual personal silos. The new world doesn’t have those silos. People, their work, needs and achievements are more visible to others. Once you’ve reached this new world, would you want to go back? I don’t think HR will want to go back. To be human is to be social. https://www.cognology.com.au/wp-content/uploads/2013/01/social-media-hr.jpg 90 100 Jon Windust https://www.cognology.com.au/wp-content/uploads/2017/01/Cognology-logo-colour-300x101.png Jon Windust2013-01-30 02:59:132016-08-10 04:02:49Is HR resisting social technology? Or the boring title: One of the ways our new crowdsourcing feedback tool is useful. How many people do you know who love HR? Dan does. His performance reviews were now all in the one place, quicker and easier than before. But his love may be short lived. He had struggled with the review for one of his team. He felt like he had been dropped into the desert Bear Grylls style. 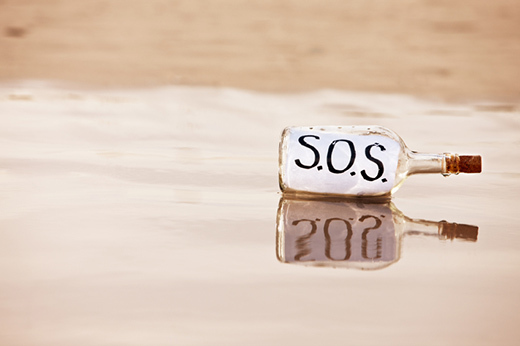 Can HR come to the rescue? It was Belinda’s review that had hit Dan for six. Belinda worked on projects right across the organisation. Dan wasn’t involved in the projects and found he couldn’t offer any feedback on Belinda’s achievements. He’d been completely lost and made a blind assessment on Belinda’s performance. That wasn’t the way he wanted to review his staff. Let’s try this again. This time Bear Grylls style with the right knowledge and tools. HR threw Dan a lifeline. 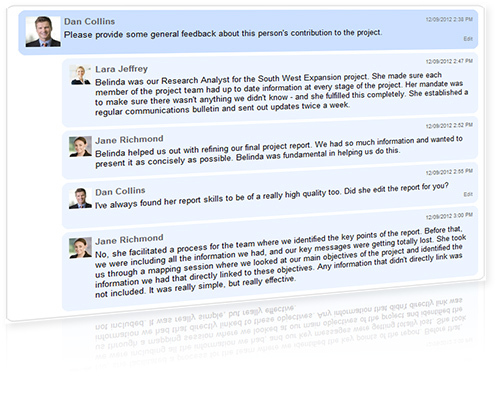 Prior to Belinda’s review, Dan used the new feedback crowdsourcing tool in Cognology. He could pick from a great range of questions, which saved him a heap of time. Dan selected the key people Belinda had worked with and Cognology took care of the rest. By the end of the week Dan had his compass. He had a complete view of Belinda’s performance and some brilliant examples of her contribution to the business. The insight he gained was incredible. He was even able to discuss the feedback online. Bear had his helicopter. Dan had HR. From that day forth, HR was known as Human Rescue. 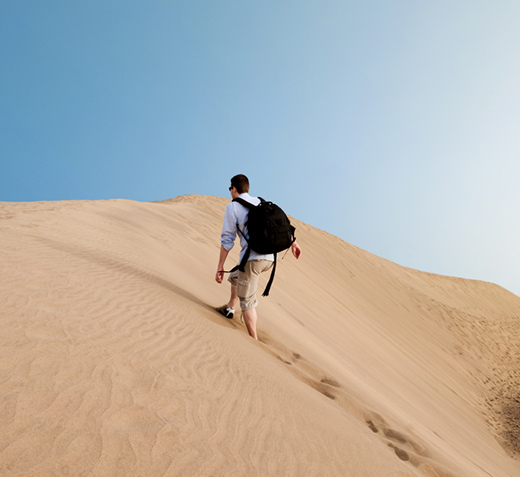 If you want to fly in and save your managers from wandering the desert, you can see more on our social enterprise software at our web site. What had I gotten myself into? I had crowdsourced for feedback using our new technology. It should have been a pretty cool process. Crowdsourcing is a thing of our times. I should have been in for some amazing results. The responses started coming in. It was mostly what I already knew about myself, not earth shattering. And then wallop, the one I wasn’t expecting. This is an open account of what it’s like to crowdsource for feedback. How it affected me and what happened as a result. Can you suggest one thing I should get better at? Most of the feedback was pretty standard sort of stuff. What I already knew. 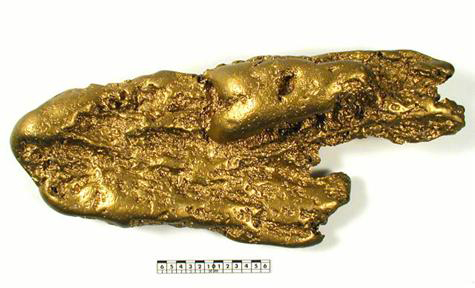 What I really wanted was a valuable nugget. I wanted to find out something that I wasn’t aware of. Something that if I changed, could really help me. I wanted something that would make me more successful. But instead I got a problem. I had put in place a new business process which was meant to be a massive improvement over our previous one. After a few months of this process, it looked that way to me. But the feedback was complaining about this new process. As an advocate for feedback I couldn’t ignore it. That would be hypocritical, saying one thing and doing another. It’s bad practice when receiving feedback to argue against it. So how could I now turn around and tell this person they were wrong? How could they not see how great this new process was? The night after I received the feedback I lost sleep. Two or three hours. Trying to work out how to handle the dilemma of wanting to be a model feedback recipient, but disagreeing with the feedback. The next day I spoke with the person who gave me the feedback. We didn’t see eye to eye on the key point. Not the sort of thing you want to promote. Fast forward a few months, what had I done about it? Well, I can’t believe looking back that I actually lost sleep over it. Once I got over the initial OMG response, I could see the feedback for what it was. Rather than making a wholesale change to the new business process, I found myself accommodating the other person’s needs. It just happened without me thinking too much about it. And what is the result of doing that? The result has been unbelievably positive. There are better outcomes for me and everyone by adjusting to this feedback. I am better off for it, not just a little bit, but a lot. This did actually turn out to be one of the nuggets I was looking for. I just couldn’t see it at the time because of my crazy emo response to the feedback. Embarrassing to say, but it’s an open account nonetheless. Request a demo of our social module to see crowdsourcing in action.